"This pumpkin spice white hot chocolate is so chocolaty, pumpkiny and creamy. 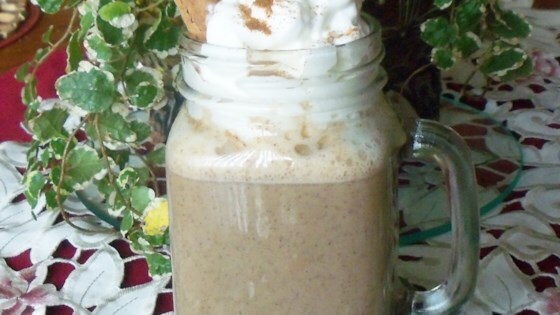 Top with whipped cream, cinnamon, and cinnamon stick." Combine milk, chocolate chips, and cocoa powder in a saucepan over medium heat. Bring a simmer, stirring constantly until chips are melted, about 5 minutes. Add pumpkin puree, pumpkin pie spice, vanilla extract, and cinnamon; whisk until well combined and heated through, 2 to 3 minutes. Use any type of milk, dairy or non-dairy. You can also mix using an immersion blender. Another 5-star drink from Yoly. Thick and creamy with that special sweetness that you can only get from white chocolate. It whips up exactly as written. Thank you for the recipe.